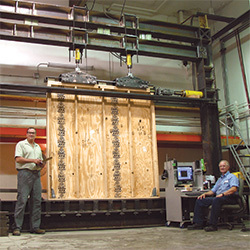 APA – The Engineered Wood Association is a nonprofit trade association that works with its members to create structural wood products of exceptional strength, versatility and reliability. Combining the research efforts of scientists and engineers at APA’s 42,000 square-foot research center with the knowledge gained from decades of field work, and cooperation with our member manufacturers, APA promotes new solutions and improved processes that benefit the entire industry. Learn more about APA – The Engineered Wood Association.